There is no denying it is now Autumn. There is plenty of green around but some of the trees are gracefully changing hue. As I drive around I see butter yellow, oranges and reds, beautiful but sad too, as we head away from summer. We've had mild days and not so much rain so I've been able to get on with a few more jobs. I'm trying to keep on top of things this autumn and winter though it's tempting to curl up with the seed catalogues and a cup of tea and just plan in my head for next year. It's better to start the changes now as I know many of you are doing. Making a late appearance is Dahlia 'Summer Flame'. Almost completely swamped by larger plants (my fault) this plant has hardly bloomed. Then I managed to decapitate this flower while trying to cut it. Sigh. I promise to look after you next year. I could have chosen autumn hued things but I'm hanging on to summer here and you'll notice so is Rocky. My daughter no longer lives here but we still have a room full of her stuff. I wondered if I'd be able to find something appropriate in this treasure cave and sure 'nuff there was Rocky from 'Chicken Run'. This is my husbands favourite film, it's so clever and is extra funny now we have hens to observe at close quarters. None of them have yet tunnelled out with a spoon. Back to the vase - I wanted to cut these pink roses, which I'm reliably informed are 'Queen Elizabeth', thanks Noelle. Storms are heading our way so they might not be standing after that. They are a very bright pink which is difficult to pair with anything so I chose Dahlia 'Karma Naomi' who is very dark and won't fight with the them. (Not all pinks are the same - discuss). Also Artemesia 'Powis Castle' as grey is always calming. Feverfew still going strong after months of flowering. I'm so glad I added the daisies as they really lift the arrangement. Finally Gaura 'Rose bicolour'. That's a disappointing name. This has also been flowering for months and is a beautiful, graceful airy plant. 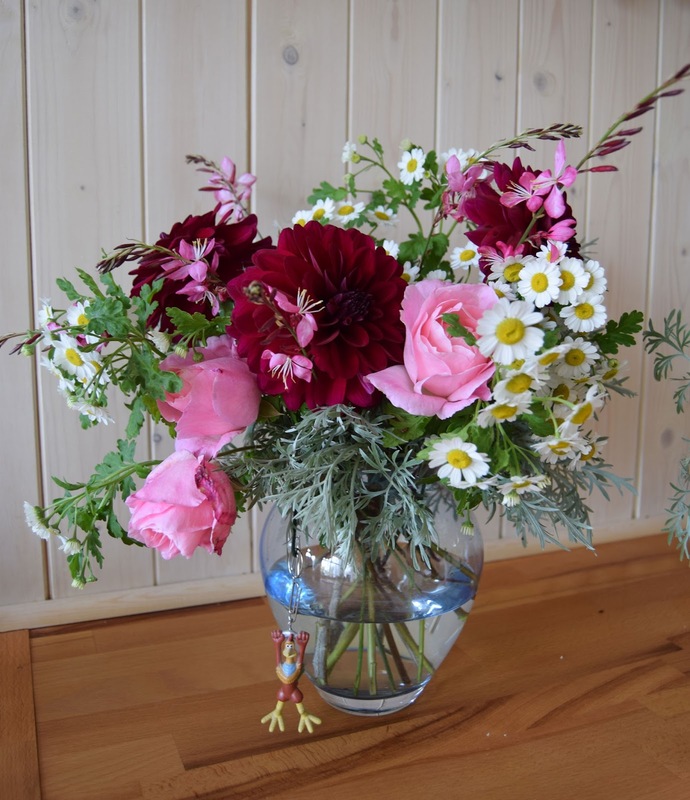 As usual I'm joining in with In a vase on Monday hosted by Cathy at Rambling in the Garden. For creative and colourful vases do visit and see what you can come up with yourself to share with other plant enthusiasts. That dahlia definitely deserves some room of its own next year, Alison! (I crowded mine too closely this year too and compounded the error by failing to stake them properly.) 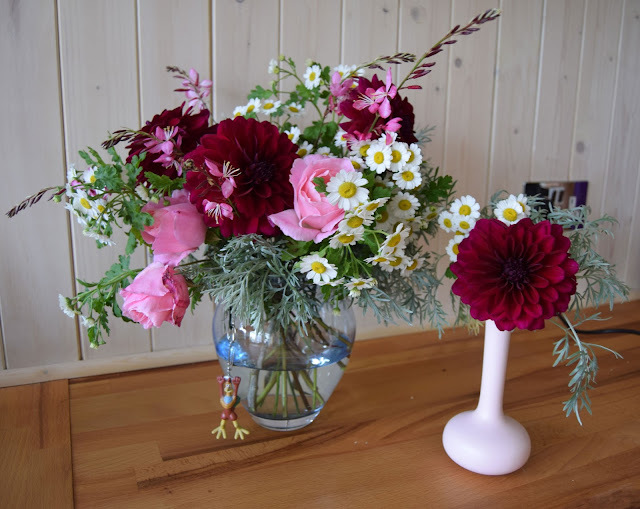 Your pink and burgundy arrangement is gorgeous and the feverfew lightens it up just perfectly. I wasn't familiar with 'Chicken Run' (until now) but I enjoyed the light-hearted addition of the chicken figurine. They will all have lots of space next year, that is my new year resolution. I did stake though, yeay! 'Chicken Run' is really worth watching, so very clever as are all the Aardman films and doubly amazing being stop motion animation. I want to change my dark dahlia for Dahlia 'Karma Naomi' which seems a much better colour and form. It works really well with your pink roses. I hope you escape the storm. Here the weather is glorious much warmer than it was in September; I'm so enjoying the pleasantly warm days instead of the torrid heat of summer. Today was probably just under 30°C, so much better than ten degrees more. Naomi is darker than I was led to believe by the photographs but very lovely. She has bloomed and bloomed in spite of being a little squashed but not as much as Summer Flame. The storm has not been too bad here, so far, but the wind is whistling around just now. Everything is tied down. I'm glad you are enjoying more pleasant temperatures. It most definitely is autumn Alison and I think that there will be fewer leaves on the trees come tomorrow morning. I would have never guessed that your dahlia was the victim of an accident. It looks perfectly at home floating about in that bowl. I bought 'Karma Naomi' for my sister a couple of years ago as her daughter is a Naomi. I've received regular photo updates of the dahlia which has now gone on my wish list for next year. The gaura looks most attractive. Name noted :) Glad to hear that your chickens are not following Rocky's escapades. I don't think the wind was as bad as predicted here though caused havoc elsewhere. It's lovely to have a plant namesake and especially if it does well. The chickens are very entertaining but are quite happy scratching about and not trying to escape, luckily. 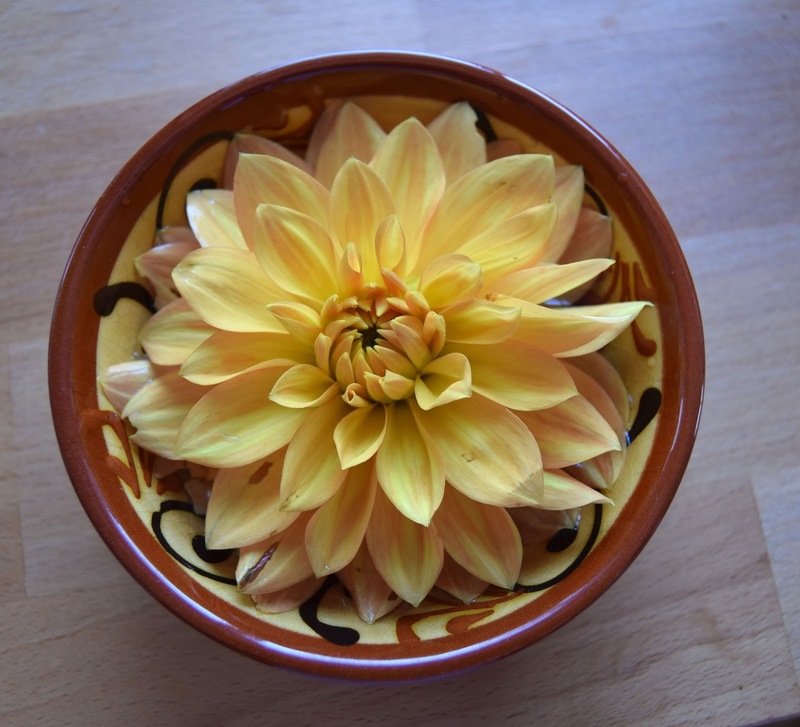 Your decapitated dahlia in the bowl is beautiful and looks like some sort of exotic dessert. Love the colors you've chosen in the holding on to summer vase. The colours do look edible but I haven't tried it. I believe you can eat dahlia tubers but I think I'd rather have the flowers. That bowl is the ideal frame for the dahlia flower. And your rose arrangement is lovely. In my mind, it's magenta (rather than pink) that finds it hard to play nice with other colours. That pink works beautifully, especially with the white and grey to soften it. But, frankly, I might even put your pink together with orange – a bold clash that can work with the right companions. That would certainly be bright and you really don't know how things will work unless you try. In one of her books, Sarah Raven describes having the bride, bridesmaid and gatecrasher in a vase and it really can wake up an arrangement to have something unexpected in there. We were in St David's bracing ourselves for the Storm....two really bad ones in one week. Love the pink arrangement, and you have done Queen Elizabeth proud. We too love Chicken Run...and our Chickens got up to all sorts of tricks. Bantams are very clever, and can certainly fly! None of them learnt to tunnel out though. Love all the films from the Aardman Studios. As for pinks...I might not wear it, but love almost all of them in the garden.